Once we have located the Text area we select the bottom right icon of this area, which is named Object as we can see from the Screen Tip that appears once we navigate on top of the icon. Here we can see the description of what the Object command does. Once selected, right away the Object window appears, with the Create New tab activated as shown below. Here we can insert a new Document Object into our document. 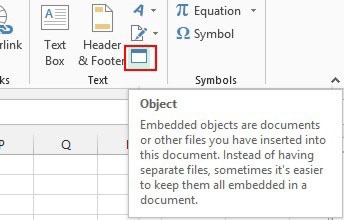 This Document Object can be whatever Document we want, depending on what programs we have installed on our computer. All we have to do is to select the Object Type from the list below, choose if we want it to be Displayed As An Icon and then press the OK button. Straight away in our spreadsheet a new blank document has been inserted depending on what type of file we had selected. 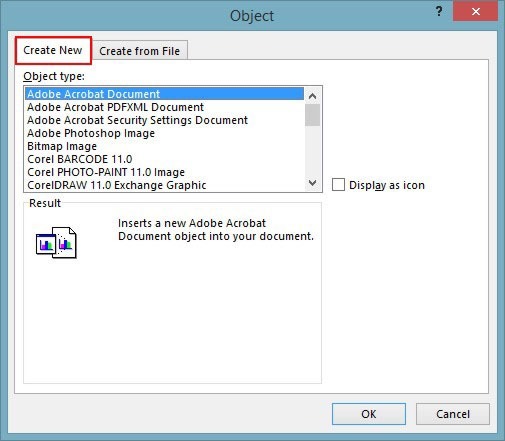 Inserts an icon that represents the contents of the file into your document. Changes to the source file will be reflected in your document. At the bottom right corner of the Object window, we notice the files icon, as long with the path and name of the selected file. If we press the Change Icon button right below we can change the icon of the selected file. Once we have finished, we just press the OK button as that is it. In the image below, I have inserted three different type of files in the spreadsheet. One is an Excel file, the other a Word file and a PowerPoint file. Once we double click on an icon, the selected file will open and be presented to us. 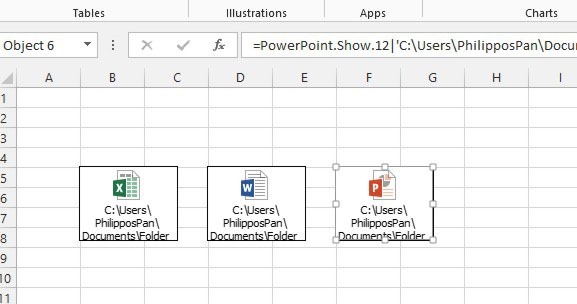 Below you can check out the video describing how to Insert An Object in an Office 13 Program. 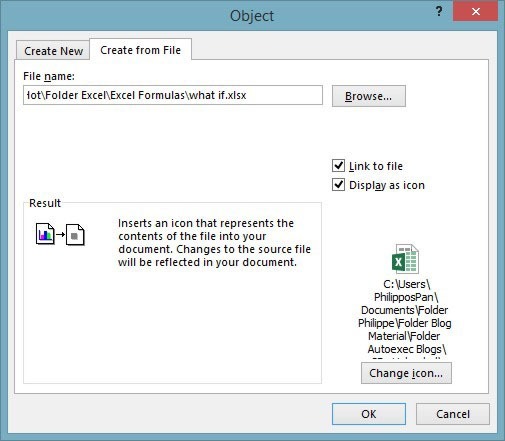 Posted on July 18, 2014, in Microsoft Office 2013 English, Office 2013 English and tagged Create From File, Create New, Display As Icon, Displayed As An Icon, Document Object, Excel 13, Insert, Link To File, Microsoft Office 13, MVP, Object, Office Smart, Smart Office, Text. Bookmark the permalink. Comments Off on Insert An Object In An Office 13 Program.